Looking for personalised baby hampers? Then look no further as we have a wide selection for newborn babies to suit all budgets. 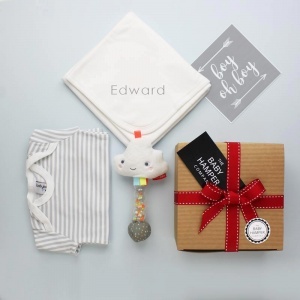 Filled with our unique personalised baby blankets, towels and other bespoke gift sets, our new range of personalised baby hampers can't fail to impress. Having a new baby in the family is a very special time, and by sending a personalised baby hamper from our range, will ensure it will be even more special. Shop from our best selection of personalized baby hampers from our UK based online store. Carefully hand selected items by The Baby Hamper Company, will be packed into our FREE luxury boxes, and delivered directly to your loved ones. Spend over £100 for free UK delivery!